Last March, Orangeworks and Actemium jointly hosted a well-attended client event at the Orangeworks location in Mill [NL]. Managers from the food, feed and beverage industries were informed about a specific project method: the Vertical Start Up Approach. Two Global Technology Leaders from a food manufacturer in Veghel shared their experience and provided the audience with some insight into two processing systems that were being built in one of the production halls. A unique opportunity. Machine builder and process specialist Orangeworks, and process automation company Actemium have been combining their strengths for many years when it comes to turn-key and specialised projects. The collaboration is so strong because the two combine all their expertise of processes and technology. They even share the project management, resulting in a single point of contact for clients which is highly appreciated. What are Vertical Start Ups? Koen Verstegen (Orangeworks) and Peter de Wit (Actemium) explain: the companies build the systems together at Orangeworks' facility. After the FAT, the system is semi-dismantled and shipped to the client’s production location and then rapidly re-assembled. Most of the work is therefore done outside of the client’s production environment. Obviously this has many practical advantages. Limited downtime is required during assembly, production can continue undisturbed and fewer special measures are required to ensure (food) safety. The benefits outlined above are due to our method Peter de Wit explains: "Design is carried out in ‘parallel’ not part by part". Preparation, testing and problem solving take place in sync. Even if a part is delayed, the rest of the process continues. And everything is integrated from control systems to cable trays. Everything is built in a sanitary way and everything works. It is, so to speak a matter of plug and play. This approach also guarantees that the delivery date promised will be met. " Henk Pietersma and Jos Wubben, Global Technology Leaders at the chocolate division of the food manufacturer from Veghel joined us in Mill. The client, Orangeworks and Actemium have been good neighbours in Veghel and have worked together for many years. Despite the fact that the company partly keeps knowhow concerning its production process to itself, it decided to use the Vertical Start Up Approach with Actemium and Orangeworks. Why? 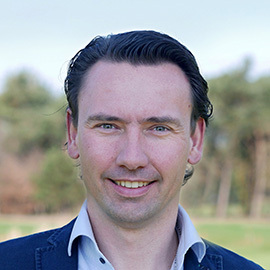 Henk Pietersma: "Nowadays, we build new systems outside the production environment for reasons of food hygiene and to prevent disruption to production. We also want to work faster, have shorter build times and be ‘right first time’. This approach is 50% faster. A decisive factor is that we can let the suppliers take the structural expertise and installation off our hands. We don’t want to pay for mistakes, we want things to be right first time. Ultimately, our customers benefit. We ask suppliers like Actemium and Orangeworks to support us in achieving our goal of moving to entirely sustainable production within a generation and their approach, outlined above, fits seamlessly. The client and supplier collaborating allows you to get more done and accelerate developments. That is why the industry stimulates and pushes developments like Vertical Start Ups. This project approach suits the client’s progressive nature, Jos Wubben adds. "Recently, we have expanded enormously and renewed older production locations. This involves a lot of new technologies. The Department of Global Engineering streamlines this. The six staff collaborate globally on technological developments. We collect information at all locations, up close as it were, another parallel with Orangeworks and Actemium’s method. They know us very well and can develop what we devise. We also want to be able to introduce technology standards so that factories don’t have to reinvent the wheel time and again when facing new construction or refurbishment. We also expect our suppliers to be able to go along with that. For example by collaborating on standard codes and symbols (S88). We work with various suppliers, locations, engineers and operators. But everyone speaks the same ‘language’. Henk Pietersma, "Whether it be new construction or renovation, our starting point is always to first design the production process, then the rest. Vertical Start Up is also a boon as far as this is concerned. For example, offline testing is much more efficient than in the production environment, which – in turn – leads to lower raw material losses. " Back to an important basic Vertical Start Up principle: the systems are built, then disassembled and subsequently re-assembled like kits. Actemium and Staalwerk customise. Koen Verstegen Orangeworks: "We first create 3D laser scans of the production environment so we can 'mirror' it. We then emulate it with a temporary steel structure at our production location. This allows us to tailor make everything both horizontally and vertically, all in relation to the space the system is to be built in. We even know where the sprinkler system will be installed. We prefer to build ladders and platforms to the correct height in our workshop, although we sometimes lack the height to do so. " Finally, at the end of the afternoon, it was time to for an exclusive tour of the various process systems that were almost ready for shipment. Koen told us that several recipes had recently been tested in the system as “it’s for one of the client from Veghel’s production locations outside the EU, where the ingredients used differ in quality”. Under Jos Wubben and Henk Pietersma’s watchful eye, the guests examined the system and were able to pose any questions they had. Staalwerk and Actemium staff answered these together. Of course there was some discussion, for instance: cable ducts; closed or open? Jos Wubben: "We consider these matters together with Actemium and Orangeworks. During the development phase we interfere in everything. After that, we have the confidence to leave it to the companies."